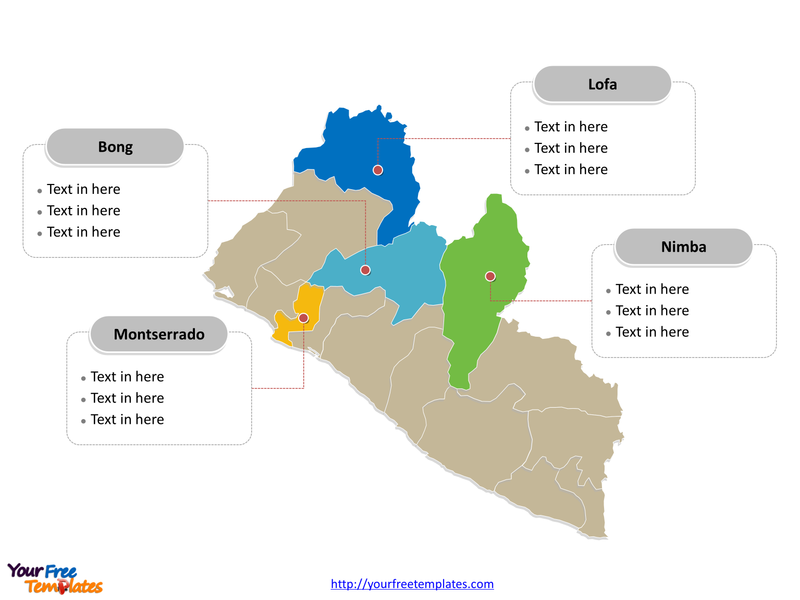 The Liberia Map Template in PowerPoint format includes two slides, that is, the Liberia outline map and Liberia political map. Firstly, our Liberia outline map template has capital and major cities on it, which are Monrovia, Buchanan, Gbarnga, Kakata, and Voinjama. Secondly, there are 15 Counties in our Liberia political map template of divisions, labeling the most populated divisions that are Montserrado, Nimba, Bong, and Lofa. Slide 1, Liberia map labeled with capital and major cities. Our Liberia map is for the country on the West African coast. The neighboring countries are Sierra Leone from its west, Guinea from its north, Ivory Coast from its east, and the North Atlantic Ocean from the country’s southwest. 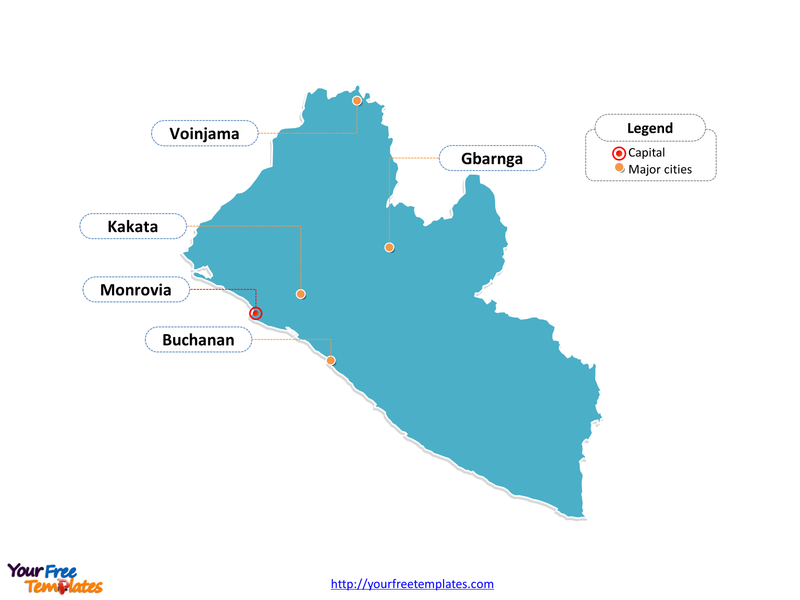 Notably, Monrovia is the capital and largest city of Liberia, furthermore, other major cities including Buchanan, Gbarnga, Kakata, and Voinjama. 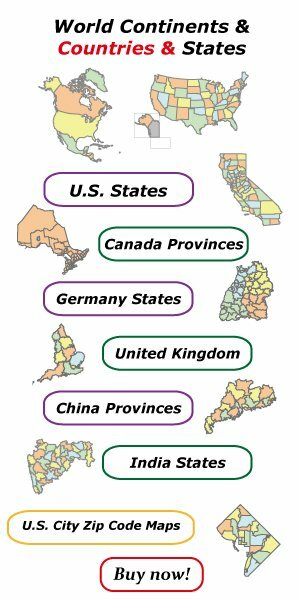 So our Liberia map slide has the capital and major cities on the outline. As a result of it, users can remove cities or include new ones to create their unique Liberia maps and apply in different decks. Slide 2, Liberia map labeled with major counties. The Liberia map is the country political division of 15 Counties. They are Bomi, Bong, Gbarpolu, Grand Bassa, Grand Cape Mount, Grand Gedeh, Grand Kru, Lofa, Margibi, Maryland, Montserrado, Nimba, Rivercess, River Gee, and Sinoe. Furthermore, every individual political subdivision is an editable shape. In a word, you can change the texts, colors, sizes, highlight some map shapes, and add your charts or diagrams. At the same time you can also refer to the fully labeled Liberia map in Wikipedia. Most important of all, analysts from marketing research companies, consultants from professional firms have thought highly of yourfreetemplates.com very much; because our maps can reduce their searching efforts and create good-looking maps with our extensive map stock.